DUP DEPUTY LEADER Nigel Dodds has criticised the UK government, and called the delay to the date by which the UK leaves the European Union “a humiliation”. Last night, it was agreed that the date the UK would leave the EU would be delayed until the 22 May if British Prime Minister Theresa May’s deal was passed; if the deal is rejected, the date would be delayed by two weeks until 12 April. The DUP, whose 10 MPs are supporting May’s government, said today that she had missed an opportunity to put forward new proposals to change the Withdrawal Agreement. In a statement released this afternoon, Dodds said that the fact that Theresa May didn’t do so “is all the more disappointing and inexcusable given the clear divisions and arguments which became evident amongst EU member states”. He said that these divisions were made evident “when faced with outcomes they don’t like” – possibly referring to the rejection of the Withdrawal Agreement by the House of Commons. Speaking at the Fine Gael National Conference, which is taking place in Wexford over the next two days, Tánaiste Simon Coveney said he had read the DUP statement today, though he warned not to pay too much heed to “emotive” language at this stage of play. DUP MP Jeffrey Donaldson will be addressing tomorrow’s Young Fine Gael session at the conference, titled: ‘North-South relations into the future’. Coveney said he hopes to get some”quiet time” with Donaldson tomorrow to discuss the Brexit state-of-play, though when asked what he could say to twist the DUP’s arm, Coveney said they do not take too kindly to that. He said they have tried to give “reassurances and clarifications” around the backstop, adding that this weekend, the British parliament, should be given the time and space it needs to get a majority over the line for another vote next week. Last weekend, the DUP held talks with Theresa May and her Cabinet, including Treasury Secretary Philip Hammond, to discuss what changes they wanted to make to in order that they would vote for it. We have been very clear that we want a deal which delivers on the referendum result and which works for all parts of the U.K. and for the EU. Dodds said today, however that negotiations with the EU had been expected to go down to the wire and accused the government to be “far too willing to capitulate before securing the necessary changes which would get an agreement through the House of Commons”. The Government has consistently settled for inferior compromises when they didn’t need to and when there was, and is, more negotiating with the EU to be done. 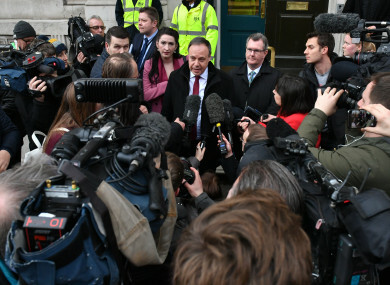 Taoiseach Leo Varadkar had said earlier that the extension gave the UK some “breathing space” and opened up the possibility of indicative votes in the House of Commons. “Lectures by the Prime Minister putting the blame on others cannot disguise the responsibility her government bears for the current debacle and the fact that her agreement has been twice overwhelmingly rejected in Parliament. The Prime Minister has now agreed with the EU to kick the can down the road for another two weeks and humiliatingly revoke her oft-stated pledge that the UK would leave the EU on 29 March. “Nothing has changed as far as the Withdrawal Agreement is concerned,” Dodds added. Email “The DUP is not happy with Theresa May's 'humiliating' Brexit delay”. Feedback on “The DUP is not happy with Theresa May's 'humiliating' Brexit delay”.